The iCarsoft i820 code reader is an instant money saver. It will connect to your diagnostic port and read codes which can be looked up to find the problem with your vehicle. Code readers are extremely simple to use, and you do not need to have had any previous experience using them. It will also allow you to view and record live data in your car to potentially find a intermittant fault. Simply plug in the i820, select the record function and start driving. You can then review the data at a later time convenient to you. 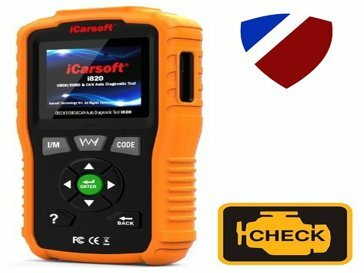 The iCarsoft i820 is the latest fault code reader on the market and will work on upto 2018 vehicles. This kit is the direct replacement for the i810 kit which has now finished production. 1.The Fastest Full Color, 2.8” LCD Screen OBDII/EOBD Scanner! 8. Turns off Check Engine Light (MIL), clears codes and resets monitors. 9．View & Graph Live Data in Color Graphing and blazing fast refresh rate for better graphing and live data readings. 10．Comprehensive Help, Including OBD Parameter, Mode Explanations & More! i820 OBDII/EOBD Scanner supports all the OBDII/EOBD test modes include: CAN, ISO9141, LPW2000, J1850 VPW and J1850 PWM. This ergonomic scan tool, though sophisticated yet easy-to-use, makes your vehicle service experience much better! Works on most 1996 and newer OBD II compliant cars and light trucks, including the CAN, VPN PWM , ISO and KWP2000 protocols. Turn off the Check Engine Light. Check the MIL (malfunction indicator lamp) status. Display OBD monitors and emission readiness status. Easy to display and easy to operate by rubber keys. Handheld unit (no need for computer) to operate. Small size & fits perfectly in the palm of your hand. Safe communication with on-board system. Powered via removable OBD II cable. No battery is needed. O2 Sensor test results for most recently performed tests from the vehicle’s on-board computer. Read the results of on-board diagnostic monitoring tests for specific components/systems. Evap System Test allows you initiating a leak test for the vehicle's EVAP system. The Review Data function allows you viewing of data from last test recorded by the scan tool. Multi-language: Multi-language English, German, Dutch, Spanish, French.